NASA's NewHorizons probe bound for Pluto isheaded for a Jupiter flyby, its camera eyes wide open, in preparation for itsswing out towards the fringe of the solarsystem. 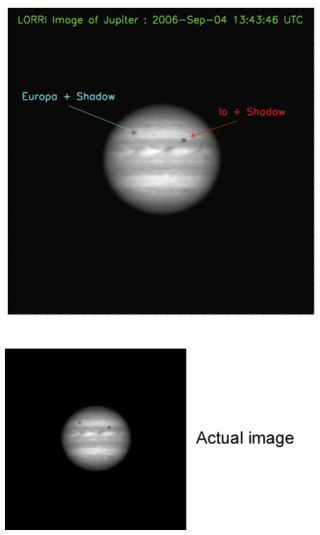 NewHorizons began taking black-and-white images of Jupiter and scanning the planet's icymoon Callisto in the infrared this week as it prepares for a closeencounter with the gas giant nextmonth. "They'recertainly all we could have hoped for," New Horizons principalinvestigator Alan Stern, of the Southwest Research Institute in Boulder,Colorado, said Thursday of the new Jupiter images. "We're still 100 millionkilometers out. We're going to get 50 times closer, but they are very nice." The imagesare expected to be released next week. NASAofficials also plan to hold a press briefing on the New Horizons mission onJan. 18. NewHorizons has been billed as NASA's fastest mission to date. The probe is set tomake its closest pass by Jupiter on Feb. 28, just over one year after its Jan.19, 2006 launch, and swing within 1.4 million miles (2.3 millionkilometers) of the gas giant [image]. NASA's Galileomission to Jupiter took about six years before it reached the planet in1995. But that spacecraft went into orbit around the gas giant and spent eightyears studying Jupiter and its many moons. While New Horizons will make 700individual observations of Jupiter over six months, the probe is hunting a farmore distant quarry. NewHorizon's Jupiter flyby, and subsequent gravity boost, will shave a full threeyears off the probe's journey to Pluto, though Stern attributes that to theJanuary 2006 launch that put the spacecraft on target for a 2015 rendezvous [flightplan map]. "We arereally healthy," Stern said of the spacecraft. "We don't have a single devicethat's broken on the spacecraft." About thesize of grand piano, New Horizons carries seveninstruments to study Jupiter, Pluto andits moons. The probe may also survey the distant icy KuiperBelt Objects if its mission is ultimately extended. New Horizons isspeeding through the solar system at about 44,537 miles (71,675 kilometers)per hour and has already shotpast Mars, the Asteroid Beltand snapped images of Jupiter [image]and a spacerock formerly known as Asteroid 2002 JF56 [image]. "It'scalled APL," said Stern, whose along with his team named the asteroid after theApplied Physics Laboratory at Maryland's Johns Hopkins University, which isoverseeing the New Horizons mission for NASA. "The 2002 JF56 provisionaldesignation is now history." The probeis expected to make its closest pass by the distant planet and its trio ofmoons on July 14, 2015. But first, the spacecraft must swing past Jupiter. Stern saidmission controllers have been working round-the-clock on New Horizon's Jupiterflyby since October, and are gearing up for a busy rendezvous in late February. "We are nowin the late stages of planning the closest approach," Stern told SPACE.com,adding that the flight plan will be uploaded to New Horizons in mid-February. "The spacecraft is going to get busy." It willalso be a busy time for Stern too, who is the not only the principleinvestigator for New Horizon's Alice ultraviolet spectrometer instrument, butalso the lead for a similar tool aboard the European Space Agency's Rosettaprobe bound for a 2014visit to the Comet 67P/Churyumov-Gerasimenko [image]. "The sameweek that New Horizons is at Jupiter, Rosetta is doing its Mars flyby," saidStern, adding that a busy year lies ahead. Stern saidthe New Horizons team ended 2006 with a celebration of sorts by honoring Venetia Burney,a nearly 88-year-old Englishwoman who - as an 11-year-old girl - gave Pluto itsname in 1930. New Horizonteam members named the probe's Student Dust Counter instrument after Burney,with Stern and mission co-investigators presenting her with a plaque on Dec.19 [image]. "Itwas fun to meet Venetia in person and to hear about how she came to name Plutoso long ago," Stern wrote in a mission status update last week. "She's healthyand witty and wishing for a chance to be at our Pluto encounter in 2015; thatseems like something we should make happen." NASA's NewHorizons briefing will be broadcast on NASA TV and is slated to begin at 1:00p.m. EST (1800 GMT).